Tuesday's terrorism attacks in Brussels were met almost immediately with outpourings of emotion and displays of solidarity online. Plantu also drew one of the most widely shared images after the Charlie Hebdo attacks in January 2015. 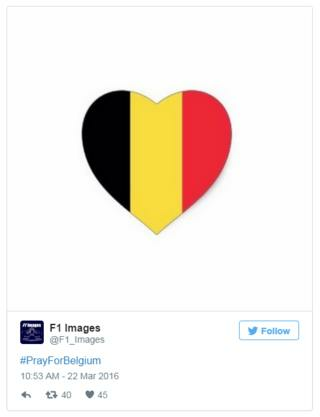 Image caption "Thoughts for Brussels and all of Belgium"
Other tributes incorporated Brussels landmarks such as The Atomium - a huge building based on a model of an atom originally constructed for the 1958 World's Fair - and Manneken Pis, a famous statue of a urinating small boy. Image caption "A little message for the terrorists"
Inside Belgium, a cluster of hashtags offering help including "Brussels lift", "open house", "ik wil helpen" ("I want to help") and "porte ouverte" ("open door") started trending as people offered assistance to those left stranded by the closing of the airport and the city's transport network. For further updates on the attacks, head to the BBC's live coverage page.